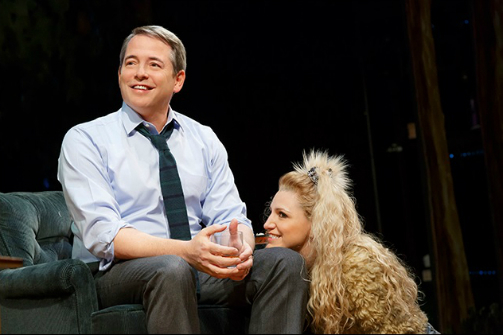 Matthew Broderick and Annaleigh Ashford in Sylvia. Photo by Joan Marcus. BOTTOM LINE: A man goes through a mid-life crisis, spending all his time with a dog he finds in Central Park; Sylvia is funny and sweet with a stage full of talent. There is a wonderful phenomenon in New York City every year that I have come to know as “Puppy Season.” It occurs when the last few winter days are fought off by the spring sun and those who have been cooped up all winter emerge from their stuffy 650 square feet apartments with man's best friend. Many who are not even “dog people” fall victim to the unconditional love of a wiggly and furry bottomed creature. Greg (played by the extremely talented and handsome Matthew Broderick), finds himself caught up in Puppy Season when a perky little puppy runs right up to him in Central Park. There's no phone number or address on her tag, but a name: Sylvia (played by human Annaleigh Ashford). The thing is, Greg and his wife Kate (the incredible Julie White) finally have an empty nest. The last of their kids has left for university and it is quite the welcome feeling. Kate is returning to work, attempting to integrate Shakespeare into the inner city junior high school curriculum, and their Manhattan apartment is now clean and calm. At least for a brief moment in time. Now that Sylvia is in the picture this well accomplished couple hits a few speed bumps on the road of life. What an enjoyable evening. I generally prefer a dark and difficult drama, but what a breath of fresh air my time at Sylvia was. The cast and team manage to utilize serious ideas in a charming way. I left feeling warmed at their jovial portrayal of Greg's mid-life crisis. There is some profanity, and some symbolic analogies about problems in relationships; with this superb cast it gives the show a bit of depth. It makes sense that Broderick is so in tune with the show: it was his then-girlfriend, Sarah Jessica Parker, who originated the role of Sylvia 20 years ago, based on Matthew Broderick’s dog, Sally. With movies and TV shows like Inside Out, What Women What, and Wilfred, we've seen the theme of communication between humans and animals. Not only is the dog Sylvia played by a human, but she has quite a lot of dialogue which the other characters cannot always understand. Even when we can talk to each other, there is still a lot of information misconstrued. Many times this dilemma occurs in relationships. Though Greg and Sylvia have spent most of their lives together, with Sylvia in the picture they find themselves in a love triangle. Everyone grows and develops, but to stay satisfied in a relationship people must grow together and not apart. Listening and being aware are skills that Greg must not forget as he spends more time with Sylvia and less time at work and with Kate. Along the way, Robert Sella pops in and out as a snobby friend, a fellow dog owner in the park, and a troubled counselor. With each different character, Sella shows his versatility and matches the energy and charm of Broderick, White, and Ashford. If you happen to be in the mood for a laugh, go see how weird we dog lovers can be. Sylvia is written by A.R. Gurney and directed by Daniel Sullivan. Set design is by David Rockwell and costume design is by Ann Roth. Lighting design is by Japhy Weidman. Sound design is by Peter Fitzgerald and Music is by Greg Pliska.